We work with First 5 Ventura County to provide every new and expectant parent or caregiver of children ages 0 through 5 years old a free Kit for New Parents. These kits are valued at $75 each. 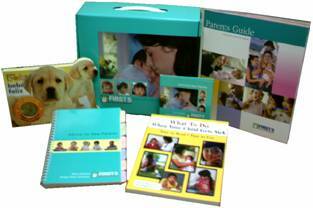 Each kit contains a celebrity-hosted DVD, an "Advice for New Parents Guide", "What to do when your child gets sick" book, "Baby's first book," a poison control guide, and many other educational materials. The educational materials cover topics such as: Growth and development, healthy teeth, obesity prevention, discipline and safety for infants and children 0 through 5 years of age. The kits are available in English and Spanish. In addition to the kits, the State of California has a Parenting Information web site with lots of useful information for parents and guardians.